It has been said, accurately or not, that when the British surrendered to the Americans at the Battle of Yorktown in 1781, the British musicians played the song “The World Turned Upside Down.” Send some of those notes out now for this poor Ashe juniper tree (Juniperus ashei), which had gotten largely uprooted but still clung to life as it hung upside down over a cliff along Bull Creek in northwest Austin. The photograph shows how things looked on July 21, two weeks after I’d first caught sight of the inverted tree. Notice how much of the juniper’s foliage remained green. This was not my first take on upside-down-ness over Bull Creek. I can’t believe it. I was going to look for another upside-down plant I thought you had photographed, and there it is. Photos like this certainly make clear the root/crown connection: not to mention the ability of plants to keep on keeping on in adverse circumstance. I am curious about that collection of smooth, vertical “whatevers” just to the left of the tree. If they’re roots, they’ve got a way to go before they find earth or water. You have a good memory for upside-down plants. My main question is how long this juniper can live in that position. The balance of brown/green foliage seemed about the same over the two weeks that separated my visits. I’ll try to go back in a couple of months to see what has happened. but in this case there was nothing to keep at least some of them from hanging down over the cliff. When I looked at the information for Nolina texana, I found this: “A graceful, evergreen garden accent complements almost any other plant and provides texture and structure in winter. Looks great flowing over a wall or hillside.” It certainly does, although I suspect the good person writing the description had a different sort of wall in mind. Yes, definitely not the kind of wall the writer had in mind. Travis County is home to Nolina texana and Nolina lindheimeriana; I don’t know which species the one hanging over the cliff was. Wonderful textures in this photo. If the tree has purchase on some soil above, I imagine it can hang on 🙂 for quite awhile. Textures are a photographer’s playthings. If there were a way to get up to the top of the cliff I’d look at the tree’s base to see how many roots are still in the ground. All I can do, though, is observe from below and check to see what happens to the foliage. 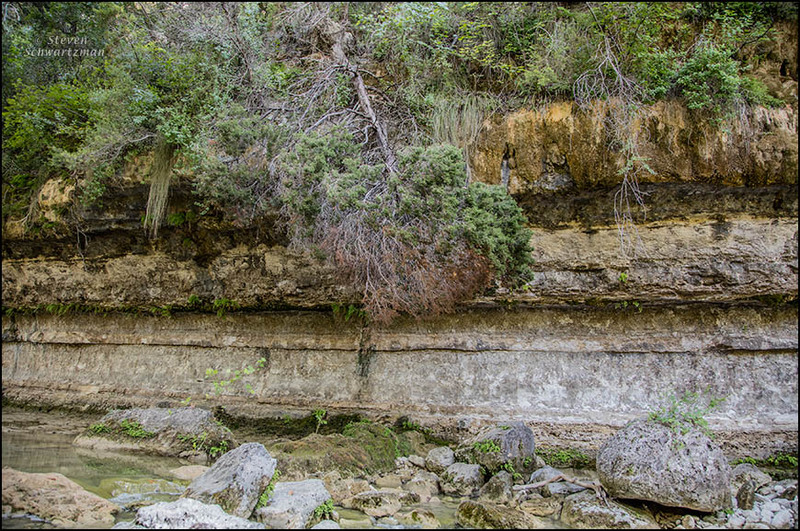 Back in the 1920’s our ranch in Comal County experienced a prolonged ice storm, downing many of the old growth Junipers by weight of the ice. The trees still stand today, a tangled mess, rather like an enchanted forest. Resilience does not even begin to describe this species! I appreciate your first-hand account of this resilient species. Is there an online picture that you can link to that shows the “tangled mess” of those junipers on your land? One thing that has always impressed me was the “determination” exhibited by trees growing in less than hospitable conditions, hanging on to ledges, atop rocks, twisted around each other, perched on the edge of a cliff. Amazing organisms. The exposed rock strata in this image is quite striking. As for determination, I’ve noticed that sycamore trees along our Hill Country Creeks are quite good at getting established in difficult places. I read about the Juniper’s ability to survive like this and found this article, although it’s about the Utah Juniper, it states the Juniper’s tap root can grow up to 40ft while the lateral roots can grow as long as 100ft. Ah, so that’s how the junipers do it. Thanks for the information.